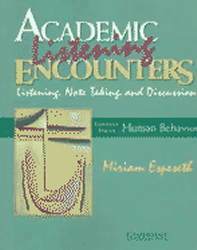 Academic Listening Encounters prepares high intermediate ESL students for listening to lectures and taking notes in an English-speaking academic environment. The listening materials for each chapter include informal interviews and authentic classroom lectures that focus on an aspect of human behavior. These materials allow students to practice crucial listening and note-taking skills.